It is nice to have a good track record: when one of the remediation contractors at the BRIO (TX) Superfund site was asked to seal in place a damaged deep monitoring well that was connecting various aquifers, the solution retained, to the immediate satisfaction of all responsible parties was to incase the well and its direct surroundings with one large column of jet grouted IMPERMIX®. 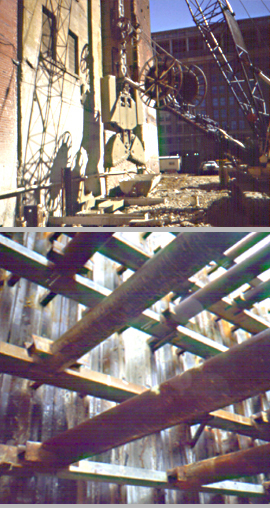 When a foundation contractor in Washington DC attempted to drive a steel sheet pile support of excavation along an old brick building, the building started to settle and a new method of sheeting placement had to be implemented: a 24 inch slot 9.5 feet wide and 62 feet deep was trenched under IMPERMIX® slurry and two pairs of sheeting were intalled almost against the building's spread footing. After setting overnight, an adjacent slot was excavated the next day, and the next double pair of sheets was placed threading the protected keyway. The vibration-less installation was successful and dripless.